The North Korean ambassador to China wants to defect to the U.S.A. But there’s a small problem, NK keeps the families of traveling dignitaries hostage. So, his daughter and two granddaughters must be extracted. With plausible deniability for the U.S. We don’t want to start WW3! So, send in a team with no military ties, with a faux mission: Sink the Pueblo, the only U.S. ship held hostage. 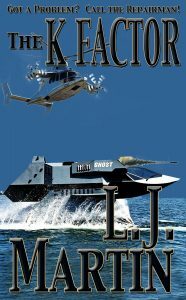 A high octane e-ticket ride, a non-stop action adventure, the 9th in The Repairman series by best-selling author L. J. Martin.